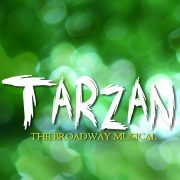 Tarzan the musical is based on the Disney film and the story by Edgar Ruce Burroughs, and with music & lyrics by Phil Collins and book by David Henry Hwang. The show follows the story of a baby who’s family dies after being shipwrecked in West Africa, and is adopted by a family of gorillas and named Tarzan. He’s not welcomed by the whole tribe and struggles to find a sense of identity. He meets an English naturalist called Jane Porter, who is exploring the jungle with her father Professor Porter, and they fall in love. Meanwhile the Porters’ guide Clayton is trying to kill the gorilla tribe and Tarzan fights to protect them. Tarzan comes to realise that he is a human and must decide what life to lead. Tarzan ran on Broadway from May 2006 – July 2007. The show also played in the Netherlands from 2007-9, as well as in Sweden, Germany and some regional production throughout the USA.